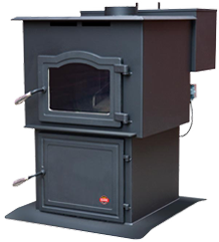 The Allegheny is a contemporary fully automatic and thermostatically controlled stoker stove. The patented Tri-Burner stoker system is easy to use, reliable and constructed to exacting standards. 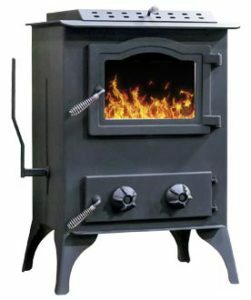 This high quality stove with its internal plenum heat is ideal for heating a country cottage, your home or business. Enjoy the cozy comfort of our steady burn coal stove. Wake each morning to the pleasing warmth of the Allegheny. The Susquehanna is ideal for large homes, garages and workshops. 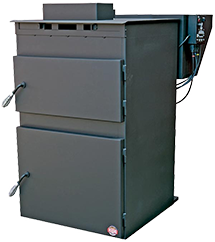 This furnace is designed to be connected directly into duct work. 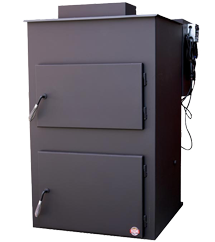 The large hopper and ash pan will allow you to set the unit to burn up to 3 days, without the worry of refueling. The patented Tri-Burner efficiency stoker system is easy to use, reliable, and constructed to exacting standards and is fully automatic. The Juniata is ideal for basements, workshops, garages and cabins. The Juniata can be used in a variety of home heating applications. The patented Tri-Burner stoker system is easy to use, reliable, and constructed to exacting standards and is fully automatic. Sq. Ft. Heat Capacity 1,800 – 2,500 Sq.. Ft. Clearances to combustibles: 18” for all Side, Front and Pipe to Wall.